ReCrochetions: Tips for Weaving In Those Ends! Tips for Weaving In Those Ends! 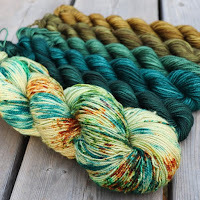 I have been designing with a lot of "mini" skeins lately, inspired by the "make-do" attitude of the Depression Era, the setting for the story my partner C. Jane Reid has written for our Spring and Summer Ficstitches Yarns Kit Club. 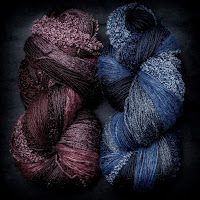 Both kits feature sets of yarn we chose to emulate the scraps of different colors or textures of yarn the main character may have had to work with when she wanted to make something to donate to families less fortunate than her own. PREORDER the Summer Kit Now! Whenever you change colors or start a new ball of yarn, it is very important to leave several inches (4-6) of yarn in each color to weave in under the stitches. You can use a yarn needle to weave in those ends, and it is a good idea to weave them back and forth in at least 2 different directions to help them stay put. You may choose to work over your ends as you continue crocheting, but it is still a good idea to leave some end out to bring back in the other direction with a needle later. Try to insert your needle horizontally along the bottom of a row of stitches, or vertically through the center of the stitches to avoid messing up the look of your stitches. Longer ends worked in more than one direction will stay put longer and be less likely to unravel all your hard work! While exploring my attic a few months ago, I came across the very first afghan I ever finished. When I found that pattern on the back of the band of yarn from K-Mart all those years ago, I never imagined I would end up designing crochet patterns, and even writing entire books of afghans! In junior high, my Campfire leader taught me to crochet granny squares during my near daily visits, on my mile long walk home from the bus stop. Sometimes I would detour to K-Mart (also on my way home) to pick up a snack, and was excited to discover they also carried yarn. Of course it was all acrylic. But I did not know anything else existed, and took pleasure in choosing several shades of my favorite blues. Now, I am very glad I made that first afghan in a nice sturdy acrylic. Because when I pulled it out recently, I realized that every end was tied in an overhand knot, and cut to about half an inch (if that). Over 20 years later, those tiny little knots are still holding strong, but it could have been a disaster! You have to understand that this was a pattern where you changed colors EVERY row. Row upon row of single crochet, with drop down "Spike" stitches to create a pattern. What was I thinking? This thing took forever (one reason I seldom design in sc)! And even if the afghan has spent most of it's life tucked away in a closet or attic (let's face it, single crochet and acrylic yarn doesn't make for the most cozy of blankets), I would be heart broken if it began falling apart. So, the moral of the story: WEAVE IN THOSE ENDS! I have been lucky that those knots did not come out years ago. Some of my other early projects did not fair as well, including those first Granny Squares which became a tree skirt I still use at Christmas. But when those short ends come out in the center of a Granny, what a nightmare! I realize that many of us are mostly self taught, and if no one every told you to "leave long ends to weave in", how would you know? I sure wish someone had told me back then. So I thought I would include a few tips I have shared with my crochet students over the years. What is one thing do you wish someone had told you when you first learned to crochet? I can honestly say, thanks to you, I've become an expert yarn-end weaver-inner. :-)And a pretty darn good crocheter, too! Laurinda, thanks so much for participating in our blog tour. I still can't get over your beautiful Rowan Vest and how incredible it is!